Sometimes you make your own fun! My friends and I traveled around Italy together for three weeks. Neither of them had ever traveled internationally (except to Mexico, where we all have homes), so it was up to me to do the planning. Not that I minded, as you might have guessed from last Wednesday's post. They got to travel for three weeks; in my way, I was there for a year. 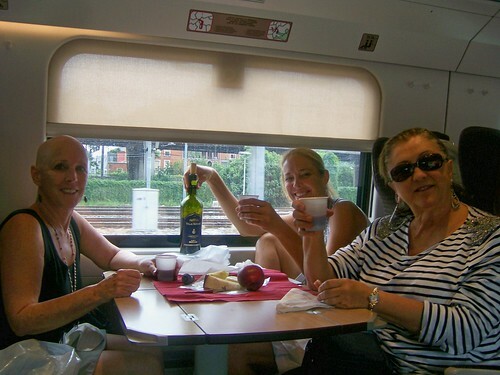 The photo above shows what turned out to be my favorite part of the trip - the picnics we ate on the trains as we traveled. Most hotels had a check-out time around 11am to noon and a check-in time of either one or two in the afternoon. We took advantage of that fact to plan all of our travel between towns during that time. It worked perfectly! The night before, we went to the best deli or cheese shop we could find and bought small chunks three or four different cheeses - almost always pecorino. We loved that sheep cheese! Then we went to a wine shop and chose whatever looked good to us that day, making sure that we tried a large variety over the course of the trip. Nothing expensive, though; we usually spent less than $10US. Our last stop was a fruit stand or store where we bought apples or pears or figs and maybe some kind of crackers. We wrapped everything carefully and packed it in my daypack with plastic cups, paper napkins, my Swiss Army knife and a corkscrew. Our lunch was ready to go when we were. If we were moving to a new town, we checked out of our hotel around 11am and walked to the train station. Sometimes I had an idea when the train would run, but if not, we just checked the schedules when we got there and bought our tickets for the next available train. We never pre-bought tickets, which would have required us to be in a certain place at a certain time. Almost all the trains run frequently, and I think we only had one time where a train was sold out. We had to wait for about an hour for the next one. We were usually able to find seats with a table in the middle, but not always. Whatever was there, we made it work. As soon as we got our luggage settled, I started pulling our feast out of the daypack. We always drew quite a bit of attention, but it was the good kind of attention - people remembering times they'd done the same thing or wishing that they had thought of it themselves. We couldn't share much of their language but the smiles all around were easy to understand. We arrived at our destination relaxed from the wine, hunger satisfied, and ready to continue with our adventure.